References to that of Patti Smith gone jazz with a Radiohead-esque backdrop just sounds like a great musical blend. Cats Park is a wonderful thing to have come out of Russia. 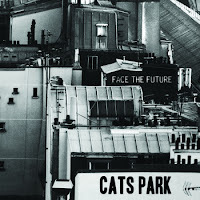 You get music that sounds effortlessly produced on the group’s debut EP, Face the Future. While only being composed of five tracks it’s just enough talent that leads you to look up everything possible via Google or YouTube. Vocalist Faijee showcases her jazz background while blending her soft, sultry voice with heart to heart lyrics about relationships and love. The driving force behind Cats Park are Faijee and bass guitarist Alexey Andreev. The two minds work as one. They create music that can also be compared to Zero 7 with a little more rock. It’s definitely a more relaxing style of music. Check out the live footage on YouTube and see what you think. If you like what you here then visit the band’s dedicated site to purchase the album. The duo is so cool they’ll even let you name your price.